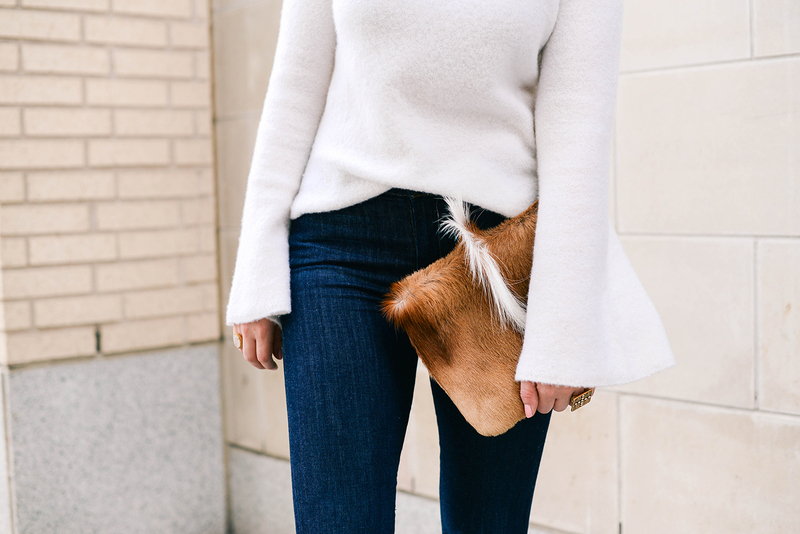 One trend I’m loving this season is the bell-sleeve sweater… anyone else? I’ve tried on a number of tops and dresses, but unfortunately most of the sleeves hit me at the wrong spot (long arms). I can usually get away with it with a typical sweater sleeve, because generally I like to scrunch them up to my elbows, but with this style it’s impossible to ignore the shorter hems. At long last, I found a sweater that fits me like a dream, and feels like one too! 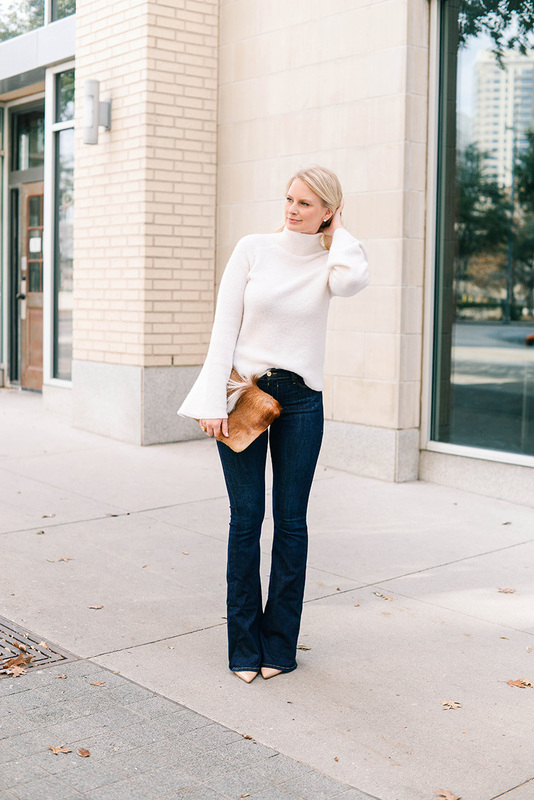 This bell-sleeve sweater is so cuddly soft I never want to take it off… it may just be the most velvety one in my closet right now, and I have a lot of soft sweaters (including the one in Friday’s post!). If you look closely at one of the close-up photos above, you can actually see the softness through the screen. I’m dying to get my hands on this Enza Costa knit. Such a great basic! If you’re loving BRIGHTS like I am, check out this new sweater from Tory Burch. I’m absolutely obsessed with this M.i.h sweater! The billowing sleeve is oh so beautiful. The length on this Co sweater would look great with black leggings and your favorite over-the-knee boots! This ribbed turtleneck comes in three different solid shades and would be a gorgeous layering piece. This tie-sleeve sweater is under $50! Also love this one that’s under $60 and nearly identical to the one I’m wearing above. This outfit is so cute! 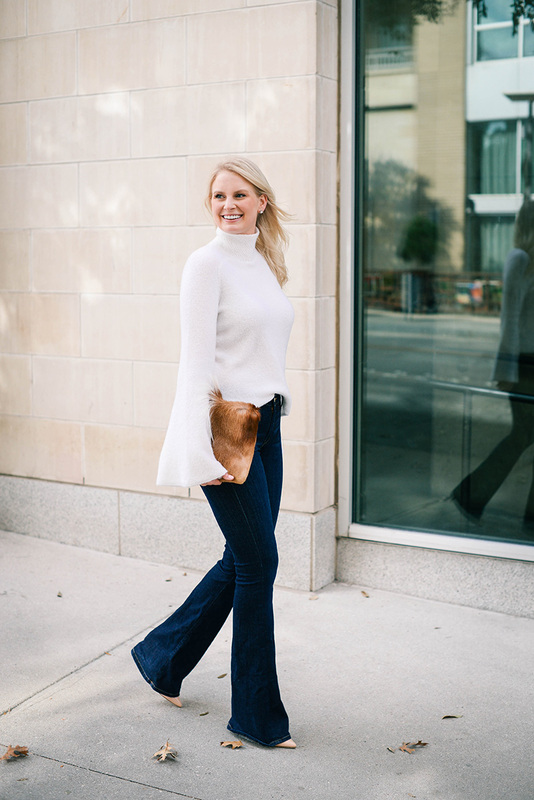 I love the bell-sleeve sweater with the flares! I love that sweater! The bell sleeves are so pretty. I like it with the flared jeans too. So chic! Love this look, Merritt!! That sweater looks insanely soft and is so cute with your flare denim! This outfit is a stunner, girl! That denim looks like it was made for your body. Amazing, and I’m loving this style sweater too. Ivory sweaters are everything! Yes! Aren’t we all loving this trend. So fun. The sweater and the jeans look so good together. 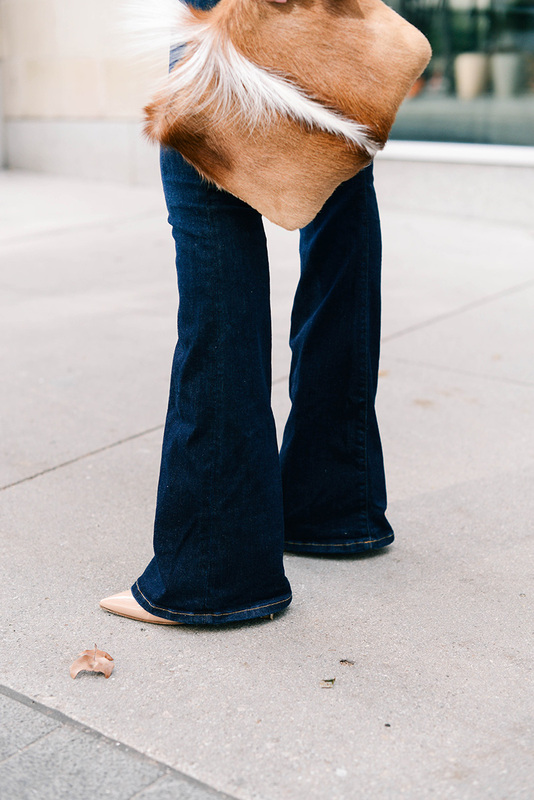 I love that you wear your flares so long. I like for mine to just barely graze the ground when I wear heels. You look great! The original sweater is actually from the brand Emerson Rose not just Emerson. Cute find! Perfect combination of the bell-bottom trousers and sweater… I now think of getting fingerless gloves just because I want to check how will they look with the sweater. Keep up being glam! LOVE this and that bag I have always been a fan of, so texas! um, this is the cutest sweater ever!